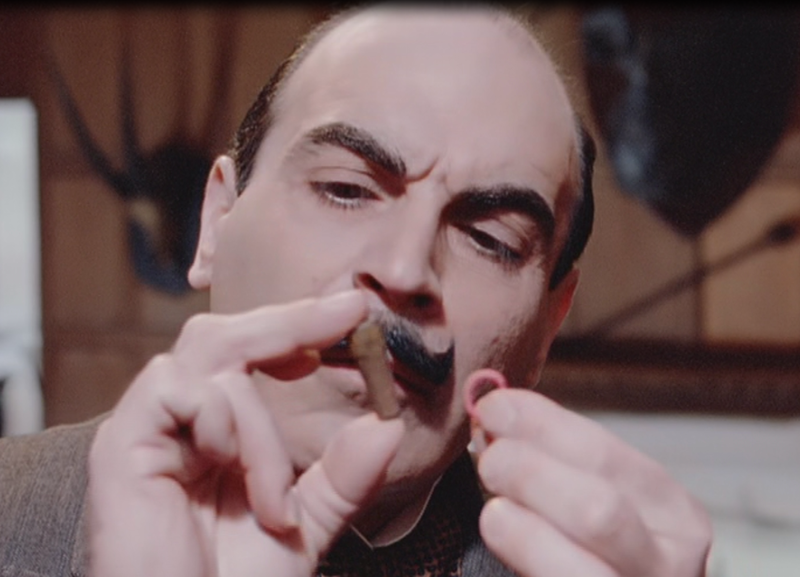 Its been 25 years since actor David Suchet grabbed a cane and waxed up his mustache to portray Agatha Christie's beloved Belgian detective Hercule Poirot. This summer, the final episodes featuring Suchet solving the most vexing of mysteries will be shown on PBS and via Acorn TV. Launched just in time for its biggest exclusive yet, Acorn TV, the premier British TV streaming service, is now available on the App Store. Acorn TV for iPad and iPhone can be downloaded here: http://bit.ly/1o1dSqo. You can see a new episode every Monday from 7/28 - 8/25. 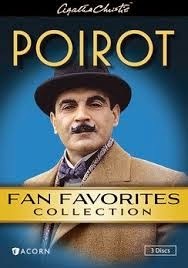 For fans like me who aren't ready to see the series end, there is the Poirot Fan Favorites Collection. These three disks feature six full-length mysteries that the dapper little detective solves by employing his little gray cells (and expert observational skills, naturally!). The episodes were originally broadcast from 1989-2010. The set gets off to an exciting start with a star-filled edition of Murder on the Orient Express. Among the familiar faces are Barbara Hershey, Jessica Chastain, Toby Jones, and (most amusingly) Hugh Bonneville. I enjoyed seeing a pre-Downton Abbey Bonneville as a valet. I'm sure it was good training for his future role-reversal! The story takes place mainly on a train travelling from Istanbul to London. As with most Christie stories, there are quite a number of potential suspects, witnesses and victims to sort through! Among the ones on the train are a Russian princess and her maid, a British teacher, an American obstetrician and a brash American businessman. The businessman, Ratchett, manages to offend nearly everyone with his obnoxious ways. 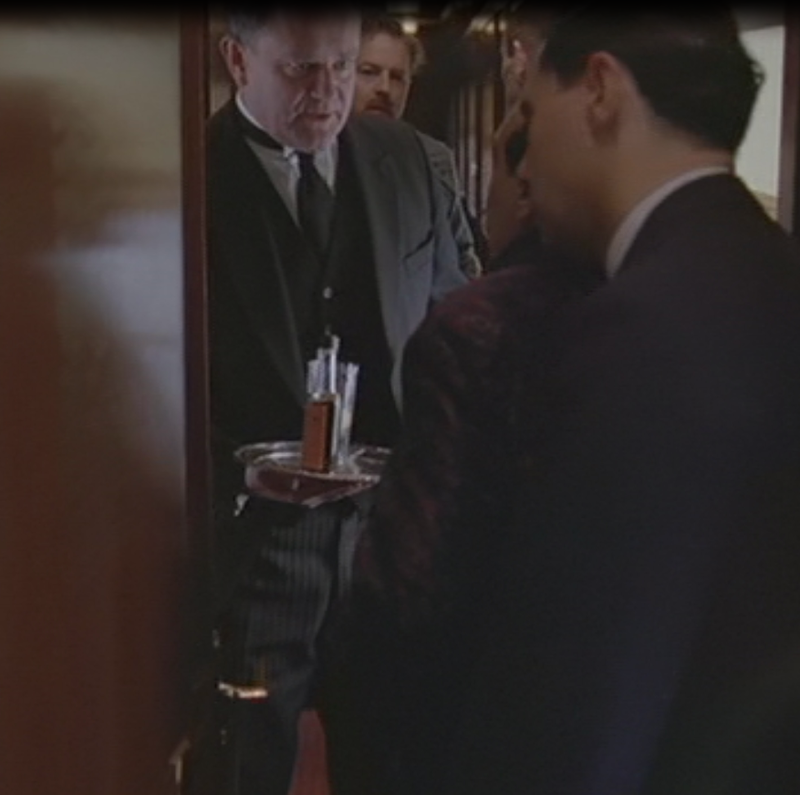 He tries to hire Poirot to protect him during the train journey, saying he fears his life is in danger. Poirot refuses. While the train is stranded in a snowdrift in Yugoslavia, there is a murder. Since the first class (where else?) cabin was sealed off from the rest of the riff-raff on the train, and since there are no footprints leading away from the victim's window, it quickly becomes apparent that the murderer must be among the travelers. makes some unpleasant announcements. As well as his sons and their wives, his granddaughter Pilar has also arrived from Spain. Her mother was Simeon's deceased daughter Jennifer. Simeon calls everyone into his study where he announces that he's changing his will and that he's cutting back on expenses since Harry and Pilar are now going to be living with him. He then throws them all out of the study. Everyone disperses to various parts of the house, and soon afterwards, a terrible commotion is heard from behind the locked study door. Upon breaking in, they discover Simeon Lee dead on the floor, all of the furniture overturned, and the safe open. Since Simeon had just been showing various people the case of uncut diamonds he was storing in there, it seems likely that the culprit was after the stones. Naturally, Poirot has to sort out everyone's whereabouts during the critical time, as well as discovering some unpleasant family secrets, but luckily, his friend Superintendent Japp from Scotland Yard is celebrating Christmas with family not too far away. He's only too happy to help his old friend Poirot investigate the crime. The Mysterious Affair at Styles takes us back to the days of World War I. Poirot and many of his fellow Belgians have been evacuated to the English countryside to escape the war. In the village one day, Poirot is delighted to meet his old friend Lt. Hastings. Hastings has in turn come to the village to visit his old friend John Cavendish a the family estate. Once again, we have a gaggle of children, in-laws, companions, wards, servants and various hangers-on to sort through! Cavendish's widowed mother has recently remarried the odious Alfred Inglethorp, much to the disgust of her family. She seems blind to all the criticism of her new spouse. Her companion, Evie Howard, voices her displeasure of the situation in such strong terms that she is dismissed from her position. Soon afterward, several people hear Mrs. Inglethorp having a heated discussion with her husband behind the closed library doors. That same evening, Mrs. Inglethorp drinks her last hot cocoa and expires in a noisy and public manner. Luckily, since Poirot is already in town, he is asked to come in and investigate. He soon discovers all sorts of clues in the dead woman's bedroom, including a green thread on the door lock, candle wax on the carpet, a smashed cup on the floor, and so forth. But what do all these clues mean? 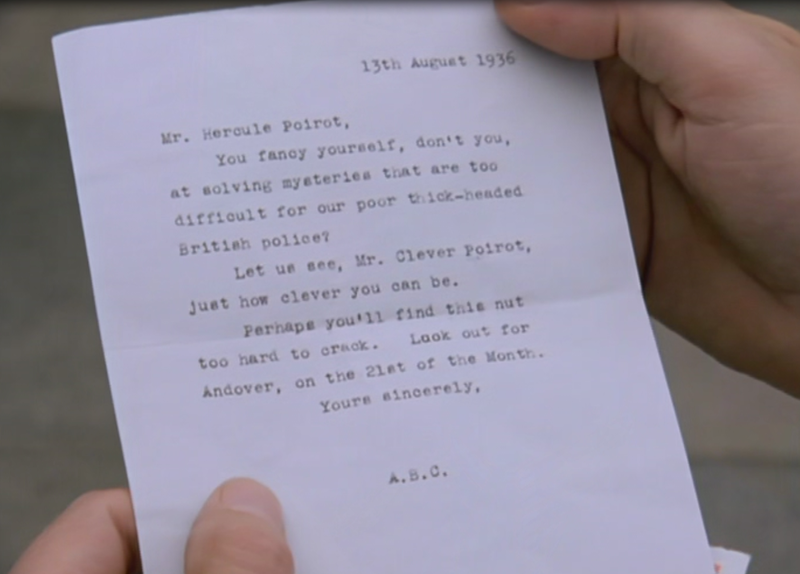 Lt. Hastings attempts to help Poirot with his investigations, but of course he's just as clueless as the rest of us. 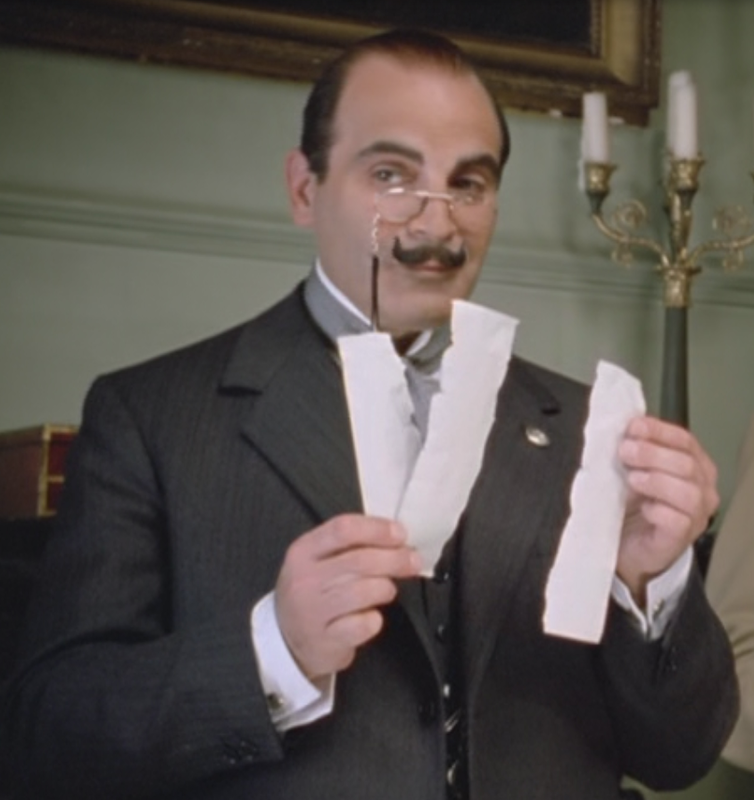 It takes a detective of Poirot's skills to sort out the clues and flush out the guilty! The ABC Murders is a case which involves Poirot personally. He begins receiving taunting letters from a killer promising to commit a murder in a certain town on a certain date. At first, Inspector Japp is reluctant to believe that anything will happen, but after Alice Ascher is murdered in Andover and then Betty Barnard in Bexhill on the dates the letters mentioned, he starts to take notice. Each victim is found with an ABC Railway Guide open to the relevant page near the body. As the deaths continue, Poirot takes the unusual step of gathering together friends and family members of the deceased to help him with the investigation. When Poirot investigates the lives of the victims, he begins to surmise that one murder is the main focus, and that the others are being committed to obscure that fact. But which victim is the real target? Someone who had no connection to any of the murder victims is arrested for the crimes, but Poirot won't let the case rest until he uncovers the true motive for the killing spree. 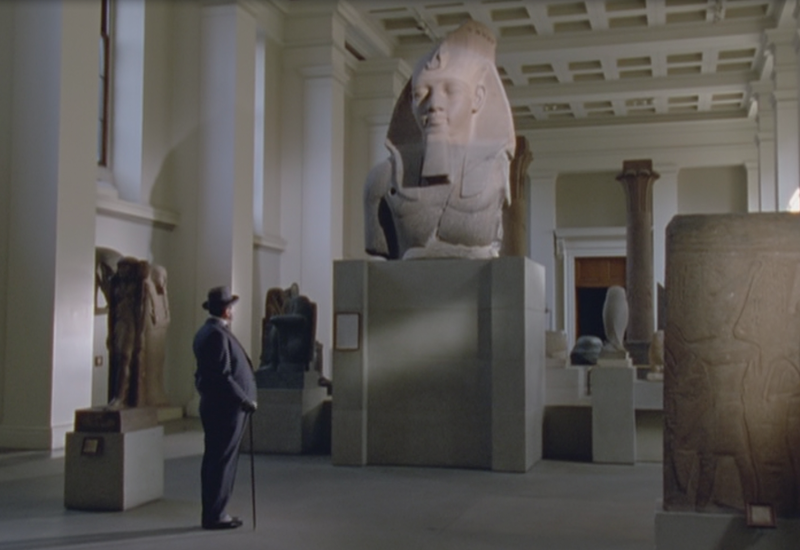 Poirot is forced to come out of his pampered comfort zone when he and the now Captain Hastings travel to Egypt to investigate some mysterious deaths in The Adventure of the Egyptian Tomb. Teams of museum workers from London's British Museum and the U.S. Metropolitan Museum are on hand when they open the tomb of the ancient king Men-her-Ra. As with all ancient tombs, the dead apparently don't appreciate being disturbed. Upon entering the tomb, the expedition's leader, Sir John Willard immediately dies of a heart attack. Before long, three other men who were on the team also die under strange circumstances. Lady Willard becomes alarmed when her son Guy says he's going to go to Egypt to continue the work of his late father. She asks Poirot to go out to Egypt and see if he can figure out what is going on. Poirot is initially puzzled, because the four deaths occur from very different causes: a heart attack, septicemia, a suicide and tetanus. Could the local rumors that the tomb was cursed be true? Poirot suspects a more logical explanation . . .
Four and Twenty Blackbirds is the final episode in this collection, but several characters make repeat appearances, including Captain Hastings, Inspector Japp, and the secretary Miss Lemon. While dining out with his dentist, Poirot is intrigued when the chatty waitress remarks on the odd habits of a regular diner. The elderly man eats at the restaurant on the same days each week, and has certain dishes that he never orders. In the past week, however, he has come in on odd days and ordered things he previously had avoided. Poirot stores this information away, not realizing that he'll soon have to investigate the circumstances of this odd behavior. The same elderly diner is found dead at home at the bottom of the stairs. The dead man, artist Henry Gascoigne, is something of a recluse. When Poirot goes to his house to investigate the circumstances of the death, he's further intrigued by the neighbor who says the elderly man seemed not to recognize her recently, and the news that Henry had been estranged from his twin brother Anthony. When Poirot attempts to question Anthony, he discovers that he, too, has recently died. The only relative the two men seemed to have was their nephew George Lorrimer, a music hall manager from London. A letter in Henry Gascoigne's pocket seems to pinpoint the exact time of his death (thanks to that long forgotten service, "the evening post"), but Poirot isn't so sure. Luckily, Inspector Japp lets Poirot into the secret lair of the new and exciting forensics department, so it won't be long before the culprit is caught. It's always a great pleasure to enter Poirot's world and observe the great detective at work. His powers of observation are second to none, and it's always very interesting to see how he manages to solve the most vexing cases. It's even funnier to see the perplexed expressions on the faces of Japp and Hastings when Poirot explains how he figured out the solutions! Disclaimer: I received a copy of Poirot Fan Favorites Collection from Acorn Media in exchange for this review.